Stumped on who or what you'll carve into your pumpkins? Fret not, Instructables.com has your answer! : Mega Man. 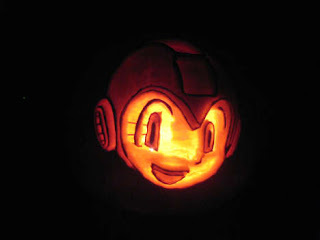 Instructables has put together a step by step process to creating a pretty nifty looking Mega Man jack-o-lantern. The process requires a lot of time and diligence, so try to complete it before nightfall! You want to get it done before trick or treating, right? Head on over to Instructables for directions! According to Nintedo's Japanese Virtual Console release schedule, Rockman 3 will apparently be released November 4th, 2008 for 500 Nintendo Points. Hopefully, Wii owners outside of Japan won't have to wait too long to purchase the game. I wonder, will the "player 2 controller easter eggs" be left intact? We'll find out November 4th! With Halloween festivities right around the corner, I figured this would be the perfect opportunity to discuss some of the "scarier moments" found within the Rockman franchise. Of course, the series isn't nearly as "scary" as Capcom's other franchises such as Resident Evil-but it does have those moments regardless. So, if the picture doesn't make it clear enough, this was my scariest Rockman moment: Rockman 2, Dr. Wily's supposed transformation from a mad scientists to a devilish extraterrestrial. The entire sequence had me crapping bricks at the age of six. 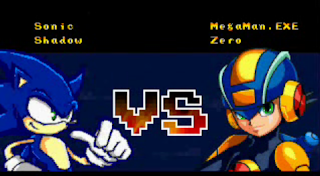 I was so frightened, I forced my younger and more skilled brother to defeat Wily for me. So, how about you? Any particular moments or events from the series that gave you chills? Traumatized you to no end? Discuss! More SSR3 Updates! Will It Ever Cease? 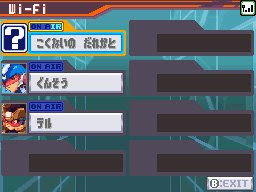 -The Wave Station updated the System section with info about Wifi gameplay. Like previous entries, Wifi is used to connect with your "Brothers" (aptly renamed to "Team Members") and participate in online Wave Battles. In SSR3, Wifi play can be utilized to recieve "Rival Noise" cards from opponents you face online. Like Brother Cards, they will roulette through the rival's four White Cards or merge their equipped Noise Change with yours for "more power." With Wifi battling, you can fight with Brothers--err-Team Members or completely random strangers. -Possably the best feature of random Wifi Wave Battles is the new "filter" option. Here, you can filter through a list of what kind of opponents you'd like to face. For instance, you can filter out all opponents utilizing Noise Modifaction Cards, thus making battles more "friendly" and less "cheap." Also, you can view your opponents' records and mugshots. -Outside of battles, you can hold voice chat conversations with Team Members and random strangers. -In Wifi battles, damage delt to decrease in Noise is toggled to make things "flow." -Finally, the wallpaper section updated with a new Burai wallpaper, who is weilding a fine looking sword. -It shows the Controls on the Bottom Screen like the News Post prior. No BGM for Title Screen though. -The Tutorials as usual, you can now do Camera Side as an option instead of turning the Camera On / Off. There's new Sound Effects as well. The Wave Virus Battle Theme is also pretty catchy. -The game looks like it has potential, even though the Demo seemed a little repetitive like the previous games. It also stinks that there's no Noise Change System to try in this particular Demo, hence why there's no Noise Gauge in any of my Camera Shots. Got a Japanese Wii? Do yourself a favor and give SSR3 a try! What Exactly Is the "Rockman X3 Buster Battler?" Every so often, a mysterious Rockman item pops up on ebay known as the "Rockman X3 Buster Battler", a seemingly over sized LCD handheld game. The first one is the game cassette (cart). You choose between regular X, full-armored X, and Zero, then you insert several parts into them (it doesn't tell you what they do on their own, at least not ingame that I saw). It scans them when you're done and gives your character stats based on them. Then it lets you choose 2 busters. You draw the busters yourself and it scans them to determine their stats (there are buster stamps if you want a base to work with). You can have up to 4 different busters saved. They you get to choose to fight against a boss, such as Vava (Vile). You choose one of four directions to attack (3 attacks) and you essentially hope that the boss moves in the direction you picked. You can also do things like charge your buster for a wider, more powerful shot, and power up your buster to increase it's attack. I haven't spent enough time with the game yet, so there may be more to the battles than I've figured out so far, and there were other game modes I haven't tried yet, too. 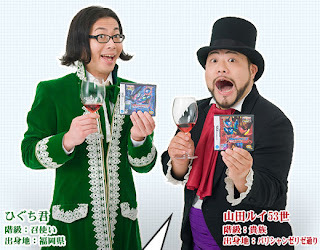 Plus, I think you can connect 2 of them together to play a versus mode, or something like that. The other one is the manga cassette. Basically, it has a few blank pages that you draw your own flip-book story of sorts. You can draw it all by hand, or you can use X3 related stamps and backgrounds to make your own little story. You can also make your own 3 X 3 slide puzzle game. Wow. How did something like this go unnoticed for so long? If the item pops back up on ebay (it frequently does), I'll be sure to give you guys a heads up. According to this topic over at Capcom-Unity, there is an undiscovered Rockman 9 secret which may in fact be a secret weapon. Taking a gander at the Rockman 9 tile set, Tornado Man noticed a peculiar "throwing" animation for both Rockman and Blues (pictured). This animation is not in the game, which has led many to believe it belongs to a secret weapon of sorts. We'll see how this one plays out. Stay tuned! 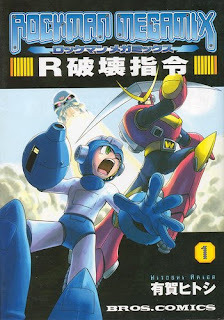 Hot off the heels of the Inti Creates event, Hitoshi Ariga announced plans for a new Rockman publication: "Rockman Maniax." 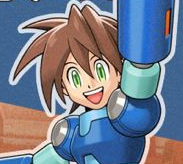 Ariga was very hush hush on what exactly Maniax is, but he assured the crowd that future details will appear on his official blog, on December 17th, 2008 (Rockman's 21st birthday). Ariga also announced plans to re-release the previous Rockman Megamix volumes and assured fans that the Rockman 9 Megamix adaption (Megamix 4) is progressing smoothly. A little more information about Maniax has surfaced. Maniax will act as a compilation of Ariga's Rockman fan art; stuff that predates his work on Rockman Megamix and Rockman Remix. Ariga previously shared these works in reprinted editions of the Megamix, but has never been conveniently collected into a single book until now. To honor the release of the Rockman 9 Arrange Album, Inti Creates threw a little bash in downtown Akihabara on October 25th. Inti's own sound team "III" wooed the crowd with a live show dedicated to Rockman 9, while Tsutiya Miki sung her rendition of "Bright Tomorrow" from the arranged album. The event also had a fairly good amount of special guests, primarily various Rockman artists such as the famed Hitoshi Ariga (Rockman MegaMix) and Yoshiro Iwamoto (Rockman X manga adaptions). 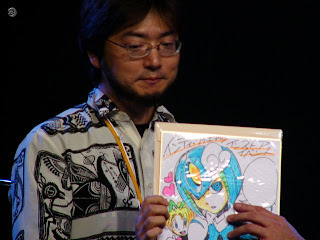 On stage, the artists presented new peices of work all themed after Rockman 9. Isn't that nice? Head over to Gpara for full event coverage and pics. While we eagerly await to see more of SSR3's side view in action, will have to make do with this SSR2 awesome hack. Mega Rock.exe, a renowned hacker, has created a series of codes that alters the battle camera's position in Shooting Star Rockman 2. As you can clearly see, we have ourselves a lovely side view, bringing back memories of the ol' EXE days. So, how does it fare? The original code is a bit glitchy, but Mega Rock.exe has carefully gone back and fixed up to the best of his knowledge. The result; a fairly nice experience, but one that doesn't really compare to the style or action of EXE battles from the days of yore. To view the code and some other zanny camera angles, head on down here. RUMOR: "Mega Man Scramble Battle" Once Existed, Shelved. I get a lot of screwy rumors in my mailbox. Some I don't even post because they sound utterly ridiculous. For example, someone claimed they found "an advertisement for a Rockman/Naruto crossover game for the PS3." C'mon, that just screams BS. Often, I'm shot a really great rumor, one that sounds decent but never comes true (with the exception of Mega Man 9). Tonight, I bring one of those really great rumors (which may or may not be true), concerning a topic shrouded in deep mystery: the existence of the Wii's Mega Man Scramble Battle. For the uninformed, "Mega Man Scramble Battle" refers to an unreleased game that appeared on a alleged European retail list back in 2007. The list featured a slew of upcoming Capcom titles, including some that were previously unannounced. The retailer list indicated Scramble Battle as an "action/RPG" title for the Nintendo Wii slated for a release in late 2008-early 2009 time frame. News of Scramble Battle spread like wild fire, but sites hosting the list were quickly forced to take them down, henceforth cementing the notion the list was legitimate. Months later, Sven of Capcom-Unity confirmed that the title never existed, nor have they ever heard of it before. However, an anonymous source from the company begs to differ. Two days ago, I was contacted by a self proclaimed "former" Capcom USA employee who offered to share information about Scramble Battle out of respect for Mega Man fans. The individual believed it would be a topic of great interest. As requested, he shall be referred to as "Joe." -Scramble Battle once existed but was eventually "shelved." The title was in pre-production back in the Spring of 2007. -Planned as a Wii game from the get-go. -It was originally produced by series veteran, Hironobu Takeshita and directed by Eiichiro Sasaki. The first phase acted as a "bland" tech demo used to test the Wii's motion capabilities. Users would point the Wii remote at the screen to shoot on screen targets in a first person view. The second phase was described as a "party game." Players would take on the role of numerous characters from the MegaMan universe and participate in several "unique" mini games, all of which utilized the Wii remote's accelerometer. This idea was scrapped for unspecified reasons. Apparently, the engine from this concept was later adapted into Capcom's other Wii title, "Zack and Wiki." The final phase was an action-RPG hybrid. 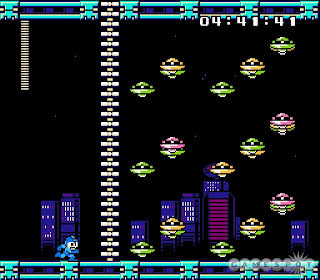 Players assumed the role of Mega Man and a "side kick" who are forced to fight their way through slews of enemies in "classic RPG" fashion. Apparently, attacks were gestured base; players would swing the Wii remote a certain way to perform various actions. This concept was green lit and began production in the Summer of 2007 with a release slated in 2008. Two: Takeshita and his team were shuffled around to other projects, focusing their attention on other titles "further along in development" at that time. As a result, Scramble Battle ceased production and was "shelved." Shortly afterwards, "Joe" left the company. "Joe" mentioned he has no knowledge of the game's current status. However, he did note that shelved projects usually return to development at a later time. It all depends on a company's priorities. I'm a bit perplexed as to where I stand on this. It all sounds good, but I can't exactly vouch for the legitimacy of the source. Make of it what you will. Now You Too Can Own Subaru's Recalled Pendant! 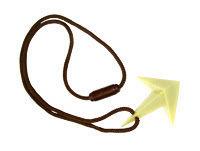 A very rare Rockman item is currently on ebay; a promotional replica of Subaru's "shooting star" pendant from the Shooting Star series. A promotional pendant? Whoopty doo. What's so rare about that? Well, it's deadly. Seriously. 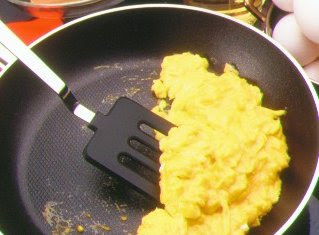 In 2006, Capcom of Japan announced a recall on the item due to its potentially dangerous design. The pendant, as you can see, has several sharp edges. If one were to trip and fall while wearing it..ouch. Collectors should definitely consider picking this up, just be sure not to wear it to bed. Capcom has once again gone and updated SSR3's Wave Station portal. First up, some info concerning the in-game Wave Stations. 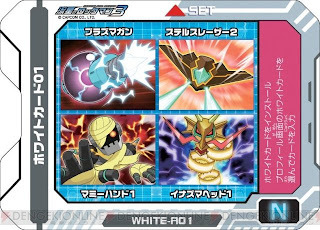 Wave Stations allows the use of White Cards; players can choose between four different types of cards which can then be used in the Custom Screen in battle. Of note, the cards to choose from varies depending on the location of the Wave Station hub. Next, the Character section has added profiles for the Dealer members: Quintia and her Wizard, Virgo, combine into Queen Virgo. Jack and his Wizard, Corvus, combine into Jack Corvus. Finally, their leader, Mister King resides over the King Foundation as the head honcho. The movie section saw the addition of the TGS footage from last week while the Event section detailed new SSR3 promo events. There, attendees can obtain an exclusive White Card, merchandise and a special Access Code. Last but certainly not least, the wallpaper section updated (surprised?). The newest wallpaper features an intense looking Solo. Moody much? Starting October 30th, Nintendo of Japan will offer a playable demo of Shooting Star Rockman 3 via DS Download Stations. The demo consists of the basics of the battle system, most likely giving players a chance to test drive Noise Changes and new Battle Cards. I'm also told there is a slight possibility that the demo will also appear on "Everybody's Nintendo Channel" on Wii (aka "Nintendo Channel). 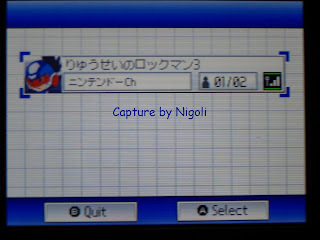 The channel acts as an online version of the Download Station in which users can download DS demos onto their DS for a limited time (until the system powers off). Most if not all the time, Download Station demos make there way onto the ENC. Fourth Grade Boys Glue MMX On Girl's Face In "Just My Luck"
Approximately ten minutes in, we are introduced to “Kate” a young girl who has a very familiar toy glued onto her face: MegaMan X (Jazwares 3'' figure to be precise). Kate blames the act on a bunch of fourth grade boys who clearly did it for the lulz. Her cousin, "Jake", eventually comes to her rescue and removes X with the magic of rubbing alcohol. Best scene of the entire movie. Just goes to show you, even chick flicks may contain MegaMan cameos. New Shooting Star Anime Incoming? According to PRC reader, "Action Hank", Shogakukan's "History of Rockman Animation" website has opened up an vacant spot next to "Ryuusei no Rockman Tribe" in the "time line" section (see pic). Two weeks ago however, there was no vacant spot. So, is this an indication of a new Shooting Star/Ryuusei anime? A full fledged television show? OVA? Film? Or nothing at all? Honestly, I don't know what to make of this. I've heard absolutley no news on an SSR3 adaption with the exception of the upcoming animated TV spot (of which isn't even remotely related to Shogakukan. Production IG is behind the project). 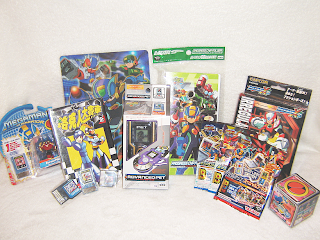 Way back in 2004, Capcom showed off a wide variety of Rockman merchandise at the "Summer World Hobby Fair." 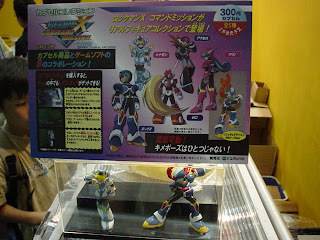 As usual, the .EXE merchandise was the center of attention, however, a particular display deserved just as much: the Rockman X Command Mission gashapon figures. Presumably developed by Takara (now Takara-Tomy), these collectible gashapon figures were planned to release shortly after Command Mission's domestic debut, but ultimately, the figures never saw the light of day and went off the radar. -Command Mission failed to meet CoJ's expectations(150,000 lifetime sales), thus they didn't see any reason financially to release the figures. Interestingly, Capcom did invest in XCM soundtracks, pencil boards and guide books. -Capcom was more prone to the idea of investing in EXE merchandise production. -Production costs might have been through the roof. Still, these would have been a great asset to anyone's Rockman collection. If I'm not mistaken, these figures were molded to resemble the poses of the in-game collectible action figures. Now that's just awesome. And yet a sole Command Mission figure exists, though not as precise as the ones displayed above. JazWares Inc. briefly produced an articulated Stealth Armor MegaMan X figure. Thankfully, the figure is quite common in online stores, so those interested can easily pick it up. -Form lasts for three turns, after wards, you revert to a 0% Noise Ratio. There are four flash videos up on the site, each depicting the abilities of both forms. The videos give us a pretty good look at some new Cards. In other Wave Station news, we have yet another new wallpaper! A stylish wallpaper featuring Denpa kun. DAAWWW. Form a Brother Band With MegaMan Himself. No Really. 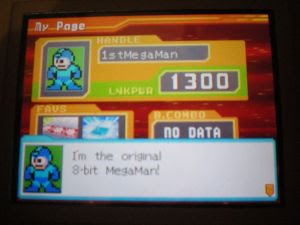 North American DS Download Stations (at participating stores) have added the ability to form a Brother Band with "1st MegaMan" (AKA Classic series MM)" in MegaMan Star Force 2 (Ninja/Saurian versions). 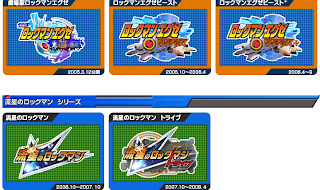 In addition to "1st MM", users can also download the secret Battle Cards, "King Grand Ranger" and "Le Mu." The promotion previously ran in Japan way back in December 2007. Participants of the Wave Masters tourney received 1st Rockman and the two cards as promotional gifts. Still playing MMSF2? Head down to your local DS Download Station and download away. More pics of 1st MM here. You knew it was coming. Sprite rippers have begun ripping the Wii version of Rockman 9. Sprite ripping brings about the usual suspects: animation frames, tile sets, backgrounds, items, etc. But sometimes, rippers manage to find unused data buried in within the game. Rockman 9 is no exception. The fine folks at Sprites Inc. have discovered this little fellow above. I most certainly don't recall ever seeing him in the game, (Note: I've yet to play the special stage, so I could be wrong) thus we can assume he's a removed enemy most likely from an early build of RM9. Of course, maybe he wasn't removed from the game at all, instead he may be apart of future DLC. New enemies? Who knows. Ryo Takamisaki's Shooting Star Rockman 3 manga adaption is set to debut in next month's Coro Coro Comic. Those eager to see Takamisaki's take on the series can rest easy, we have ourselves a three page preview...in english. Props for the scans and translations go out to Malik of Shooting Star Rockman On-Air. Check out her efforts here. For the uninformed, Ryo Takamisaki was the creative force behind Rockman.EXE's Coro Coro adaption. It was long rumored he would helm the Ryuusei adaption (upon the manga's announcment in late 2006), but he was seemingly replaced by Masaya Itagaki. I must say, it's a bit refreshing to see Takamisaki return to the franchise. The previous SSR manga was far too silly (both in the plot and art departs) for it's own good. Here's hoping for more Takamisaki quality! -Hero Mode: 100 WiiPoints, 2 blocks. -Super Hero Mode: 100 Wii Points, 2 blocks. -Special Stage: 100 Wii Points, 2 block. Not much is known about Hero/Super hero mode, so be cautious about your purchase. You never know what you'll be getting yourself into. and most likely all sorts of conundrums (based on the pic, a crap load of UFOs). 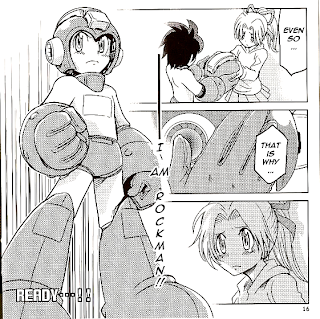 Ariga's Rockman 9 MegaMix Scanned and Translated! Rejoice! 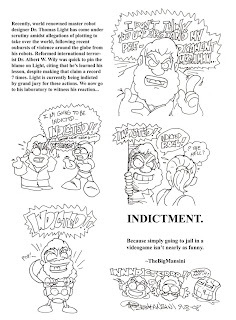 Heat Man of The MegaMan Network, went out of his way to scan and translate the special Rockman MegaMix manga that came bundled with the RM9 Arrange Album. Give the manga a read here. It's beautiful. 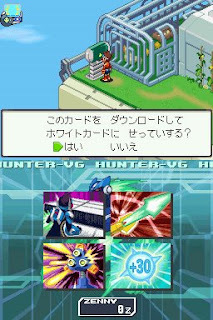 An interesting Rockman X1 beta discovery. Apparently, the devilish Hoganmer enemies were even more devilish in the beta: they were once mobile. Thank god this was removed. They're already difficult as is. Miss Forte? Vent Your Frustration! The announcement of Fake Man certainly struck a cord with some fans. Many had hoped Forte would make his triumphant return in Rockman 9, but things turned out otherwise. Beyond the appearance of his schematics during the closing moments of the game (right), Forte was virtually absent from the title. What gives? 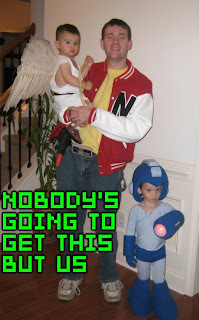 Maybe Capcom felt his presence would take away from the retro/NES/Famicom vibe of the game? Or maybe they simply could not figure out a way to properly include him in the plot without his appearance feeling "forced." Regardless, Forte sat this one out. Did a lack of Forte tick you off? Do you even care? Discuss! One of the highlights of the SSR3 experience is the "Noise Modification Gear", special Cards used to further enhance one's skills and abilities. Coinciding with SSR3's November 13th release, Noise Gear will sell for approx. 210 per pak, each containing five cards. "The example of a Noised Card given is called Wheelz Noise. Like other Noised Cards, such as the cards Burai Noise and Gemini Spark Noise, it comes with a sub-class, in this case, Five of Diamonds. It is safe to guess that the limits on the Noised Cards will be one card per sub-class (Ace, Heart, Club, Diamond, Shooting Star Joker). 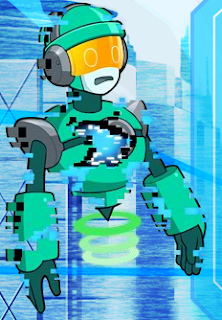 Noised cards specifically modify Rockman in his normal state as well as the Noise Changes and Merge Noises. The Wheelz Noise card will change Rockman's normal charged shot to Giza Wheel." "The example of a White Card is the same one we got before: White Card 01. 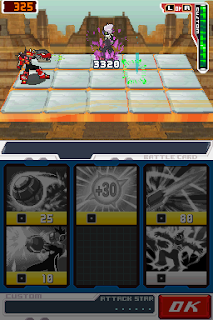 White cards work similar to the Wave Command Cards of the previous game's Touch Command System. They are installed onto your profile by use of a Blank Card in game. You can have as many White cards installed as you have Blank Cards available. White Card 01 has an electric theme. Selecting it in the game will activate a roulette between four cards. In this case, the cards are Plasma Gun, Stealth Laser 2, Mummy Hand 1, and Inazuma Head 1. " "The final example is that of a Rezon Card. Rezon Cards specifically modify the Finalized Noise Changes, Black Ace or Red Joker, effectively allowing for customization of your ultimate form. This particular card, Ultimate Wood Master will partially activate upon achieving a Finalized Noise Change. When Rockman Finalizes, the stage will be covered in kusamura/grass panels. In addition, if the Rezon Card is active, all Wood Cards in your equipped folder will gain +3 Attack Stars. There is probably a different Rezon card that will grant Wood Body to the Finalized Noise Change, allowing a player to further benefit from the field change." "What should be noted is that the artwork for the card features four wood type bosses. Three of them are bosses from previous games: Goat Kung-Fu, Ophiuchus Queen, and Condor Geograph There is a new boss who appears to be a moss-statue monster with a cannon in its mouth. Something to note is that it bears the Club motif, similar to the Spade motif found on Spade Magnets, meaning that this new boss will be one of the four bosses affected by Illegal Cards given by Queentia and Jack." In related SSR3 news, the official site has seen some updates. Nothing truly significant but noteworthy nonetheless: Two wallpapers have been added: One of a peeved Luna and the other of Rockman and the Noise Changes. The Satellite Server's welcome Wizard has apparently...died. Yes died. In his place is a sole Denpa Kun. Rest in peace my man. We hardly new you. 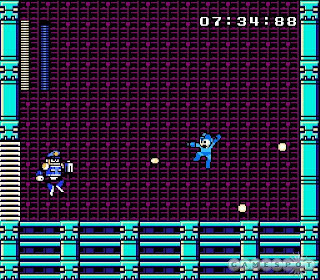 RM9 Secret Stage Boss Revealed: "Fake Man"
Read the full GameSpot interview with Takeshita for more interesting points such as the potential of a Rockman 10 and more. "This took about 15 - 20 hours. I got respect for the hot glue gun as I received several burns and blisters from it. The Cars bike helmet was $20, frisbee free. LED's/electronics were about $10. The foam/fabric was from Goodwill type places and were about $5. My only regret is that the helmet seems big on him. I would like a little bit tighter fit, but I am still very happy with the final product. " "This took about 15 - 20 hours. I few less burns and blisters during this build, even though it was much more complex. The tupperware was about $15, LED's/electronics $15. When I finished this ... I was giddy. I thought it looked pretty good for my first ever costume build. All the warm comments from the Destructoid community just drove me on further. " "This was about 6 hours. By this time, I stopped burning myself (Yay!). The only additional cost here was the blue foam, which I think was a couple of dollars at Goodwill." "This was about 4 hours. " "My wife said she spent about 5 hours on this. Again, can't thank her enough. " "In closing: When I first started this costume, I was not planning on it being this involved. But the more I got into it, the more excited I got, the deeper it took me. When I made the decision to add the LED's is when it made things more complicated (at least for me). I had to think about how I was going to mount them, where I was going to store the batteries, how I was going to get them to glow. In the end, I really think the LED's made the costume, not just for the coolness factor of it lighting up, but also all the decisions I made because of them." When I got done with the costume, and fitted it on our son for the first time ... my wife just looked at me and started laughing. I asked her what she was laughing at, her response: "Your like a little boy Christmas morning getting ready to open all your presents, with this silly grin plastered on your face." I couldn't help it ... I was just so happy, and that described my joy perfectly. And it also worked as a cool thing for me and my son to do together. He really enjoyed helping me (even if it was simple stuff like throwing away some trash). 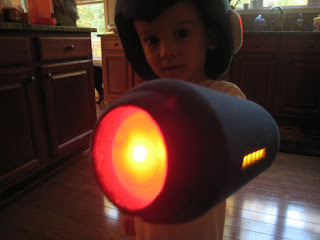 As we were taking pictures my wife said to our son, "Move the gun up a little" to which my son replied, "No! Its a Mega Buster!" I could not have been prouder! " Check out cranieum's gallery for more pics of the finished costume! Rockman 9 Inspires a Possible New 16-Bit Sonic? Developers are indeed taking notice of Rockman 9's success: Konami has previously expressed an interest in creating a retro styled Castlevania, the popular Cave Story is seeing an enhanced 8-bit port on Wii and now Sonic Team is looking at the possibilities of a new 16-bit Sonic. Nishiyama: "There's always the possibility. Whether it would be viable remains to be seen, but having a new game - or even a remake of the GBA games, which we now can't use [thanks to the DSi] - would certainly be possible. If we made one, would you buy it?" Nishiyama: [laughs] Great! One of our ideas has been that on older consoles, you may have had only 16 colours. 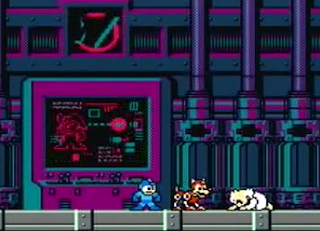 One thing we could do is make a game like Mega Man 9; do a new Sonic, but in an old style." Props to SEGA for even considering this. 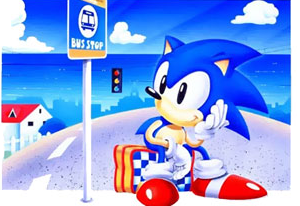 I know I'm not the only one disappointing in Sonic for the past decade. A 2D/retro Sonic title would definitely makeup for all the crap we've had to put up with as of late (Shadow, Princess Elise, unnecessary crappy friends and the Werehog). Isn't it amazing how a single game manages to continuously inspire an entire industry? Rockman 9, a title that daringly presented its 8-bit self to a over-saturated "1080P, high definition, dark and gritty, FPS" market, is paving the way for simplistic/retro games. That's just simply amazing. Preview the 'Rockman 9 Arrange Album' With YouTube! For your listening pleasure, here's most of the tracks from the recently released Rockman 9 Arrange Album. Give it a listen and share your opinions! Like what you hear? Do Capcom a favor and purchase the soundtrack! I'm very impressed with the new look and feel of the Shooting Star series, but it still doesn't hold a candle to the EXE series. According to Game Watch, those who pre order SSR3 (either version) will receive one of three special promotional at select stores. Toys R Us will carry a special pouch, presumable a DS carrying case. Apita Chain Stores (?) will giveaway a digital wall clock, and Jusco/Super Center stores will carry a leather Satellite Police case. Neato. 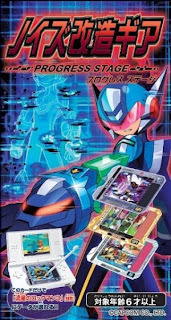 Releasing November 13th for 500 Yen is the Shooting Star Rockman 3 Data Book. The book doubles as a strategy guide and a special database for the in game Satellite Server. Based on my computer translation, it sounds like the book will offer special codes to receive bonus Cards in game. 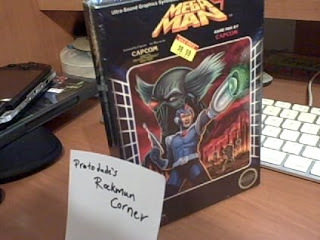 Yesterday afternoon, my MegaMan 9 Press Kit arrived all bundled up like a newborn child. Now, I'm pondering if I should unwrap it from its plastic and behold the sites inside the box, or leave it as is, unopened. It looks quite good on my "mantle" as is, but I'm still tempted to pry it open and screw around with the asset CD and cartridge. The Child In Me Is Jealous. Very Jealous. Marvel at this well crafted, custom made Rockbuster! 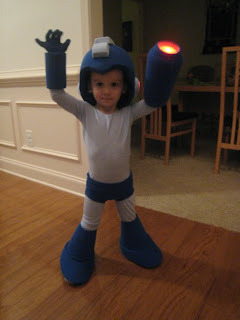 Craineum of Destructoid has been diligently constructing a MegaMan costume for his three year old son. The first step was creating the helmet which turned out pretty neat. The next step, the creation of the Buster, involved a lot of time and effort. Based on the pics, the effort paid off. It looks absolutely amazing. Can't wait to see the rest of the costume! Win Oodles of Goodies In the "MegaMan Master Cup!" "FlashManEXE.com is proud to announce the 1st Annual MegaMan Master Cup! The MegaMan Master Cup is a trivia challenge event open to MegaMan fans! FlashManEXE.com is hosting this event in cooperation with our sister site, Eye Lazor Beams EX! as a thank you to all of our loyal customers and supporters over the last four years. The trivia challenge will take place at the official Eye Lazor Beams EX! Chat Room on October 17th, 2008 at 7:45 PM Central Standard Time and will last until 8:45 PM. Registration for the event begins at 7:30-- latecomers will be allowed to participate but will not be able to make up for any missed questions, so if you want a better chance at the high score, show up on time! The grand prize of the event is a bundle of awesome MegaMan merchandise!" I know for a fact some of you "Rockman knowledge nuts", (example of a knowledge nut: Those who know who Hayatom/Mukuo Inc. is) so you might want to invest some time into this! Check out FlashMan.EXE.com for more contest details! Okay, so the SEGA Vs. Capcom rumor turned out to be a dud (at least, for now...), but we may be getting the next best thing: "Tatsunoko Vs. Capcom" (Rockman Trigger and Roll chan included). Good to know. However, I am very curious as to how Capcom will jump over the legality hurdles; Tatsunoko character rights are all over the place in the US. Will they manage to buy them all up and defeat "Legal Licensing Issue Man?" One can only hope. -Keiji Inafune made a special appearance Friday to talk about Rockman 9. The game was done as a "gift" for Rockman fans who've supported the Blue Bomber for the past 20 years (awww). Developing RM9 was a bit daunting on the developers, many were left confused on how to create a game that had intended restrictions such as color, sound and numerous mechanics. Nevertheless, they pulled through. -Inafune expressed how satisfied he was with the game's sales. -Commented on Rockman's "charm" through other forms of merchandise such as T-shirts and soundtracks (Inafune's actually wearing a RM9 Tee. DO WANT). -Inafune expressed his great respect for Blues. This respect led to him being included as a playable character in RM9. Expressed his desire to create more "rivals." 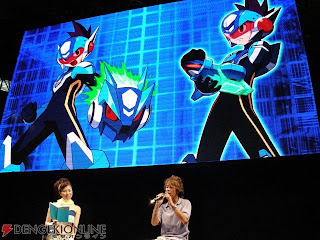 -Shooting Star Rockman series producer Takeshi Horinouchi joined Inafune at the stage. There, he expressed his desire to target the series at young boys for lasting appeal. He briefly touched on the subject of Rockman's new design. The change was done in an effort to reflect the player's actual growth. 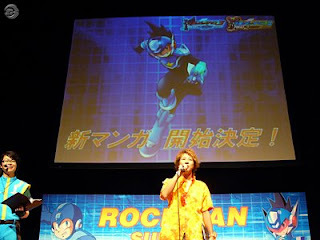 -Horniouchi discussed a few SSR3 related items such as the Noise Modification Gear (allows players to "create" their own Rockman) and promoting the game through the comedic duo, "The Bearded Barons" boy band, "Kick Chop Busters" and an upcoming animated commercial. -Hornicouhi expressed his wishes to keep creating Shootig Star games once a year in an attempt to "reflect the players growth with the game's characters." 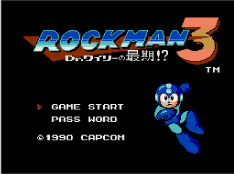 -Finally, Inafune expressed his great desire to create Rockman DASH 3. Inafune is well aware of the many fans who want to see a return to the series, thus he encourages these fans to continue to support the title in hopes of finally being able to produce it. 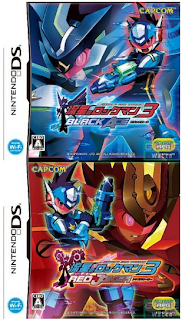 Thanks to Rockman 9's success, a DASH3 is certainly a possibility, but Inafune needs our support! 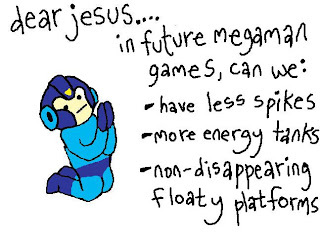 The Rockman 10 Wishlist: What Do You Want To See? There's no doubt in my mind we'll eventually see a Rockman 10. No sir. Regardless of what Capcom says, the title seems to be doing very well financially and has been positively received by both the fan base and the gaming press. So, in light of the possibility of a tenth iteration of the Classic series, what do you want to see? Difficulty settings? A bigger shop inventory? Forte? More female Robot Masters? Are You 'Effin Kidding Me? 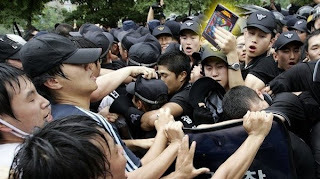 No doubt about it, fans are hungry for the MegaMan 9 Press Kit. So hungry that they are willing to pay over a $1,000 dollars for it. Ending at 23 bids, this $1,500 auction for the press kit is now on it's way to the lucky winner. Congrats. But seriously, in desperate economic times, who in the right mind would pay that much for a press kit? A kit containing an empty NES cartridge and an asset CD? Yeah, the kit is made of pure win but come on, it's definitely not worth that much. Sure, Capcom had it stocked at $2,000, but that was intended as a joke to scare off those who got a hold of the super secret URL. Sorry guys, but this is just getting ridiculous. It's only a press kit. It's not like its a hard copy of the game. Tons of SSR3 news today courtesy of multiple sources! -There will be 150 standards cards, 45 Mega cards (meaning 15 bosses per game), and 10 Giga cards. -Corvus and Virgo are revealed as FM-Seijin that have been corrupted by Noise and are affiliated with the villains. They are fire and water element respectively. -The villain organization is known as the "Dealers". -The female Queentia and Virgo can merge to form the water-element type "Queen Virgo". She fights with a vicious water dragon. -The younger brother Jack and Corvus can merge to form the fire-element type "Jack Corvus". He attacks with burning claws and wings. -There is another member of the Dealers known as "Mister King", a genius scientist. 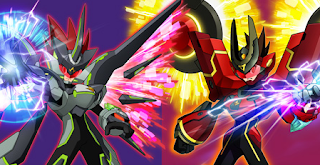 -Black Ace abilities: Cards in folder will change, 2x power when using War Rock Attack, Buster Level Max, Auto Lock On, Air Shoes, Float Shoes, Quick Gauge, NFB: Black End Galaxy. No Charged shots were listed for either yet. -Libra Noise: Dual fire/aqua type, Weak against Breaking, +10 damage to fire and aqua cards, 5% HP recovery when using non-elemental cards, charged shot becomes "Side Spread", NFB is "Meteorite Barrage". -Corvus Noise: Fire type, weak against Aqua, +30 damage to fire cards, immune to poison panels, HP bugs, or the Black Hole card, charged shot becomes "Shocking Flare", NFB is "Atomic Blazer". -Cancer Noise: Aqua type, weak against Elec, +30 damage to aqua cards, aqua cards will bubble the opponent, charged shot becomes "Bubble Shoot", NFB is "Dynamic Wave". -Gemini Noise: Elec type, weak aginst Wood, +30 to elec cards, swords will paralyze, gains the ability to use the Tag system from EXE6 when equipped, charged shot becomes "Rocket Knuckle", NFB is "Thunderbolt Blade". -Ophiuchus Noise: Wood type, weak against Fire, +20 damage to wood cards, non-elemental cards will confuse opponents, immune to confusion or blindness, charged shot becomes "Green Shot", NFB is "Elemental Cyclone". -Cygnus Noise: Wind type, weak against swords, +10 to non-elemental cards, +30 to wind cards, Air Shoes, Float Shoes, charged shot becomes "Feather Vulcan", NFB is "Meteorite Barrage'. -Ox Noise: Fire type, weak against aqua, +50 to fire cards, Super Armor, Auto-Lock on non-elemental Break cards, charged shot becomes "Heat Cannon", NFB is "Atomic Blazer". -Virgo Noise: Aqua type, weak against elec, +30 to aqua cards, immune to freezing and bubbling, charged shot becomes "Aqua Wave", NFB is "Dynamic Wave". -Crown Noise: Elec type, weak against wood, +20 to elec cards, summons a special card each turn, non-elemental cards can inflict blindness, charged shot is "Plasma Shot", NFB is "Thunderbolt Blade". -Wolf Noise: Wood type, weak against fire, +10 to wood cards, +30 to sword cards, Quick Gauge, Auto-lock on for wood cards, charged shot becomes "Shock Claw", NFB is "Elemental Cyclone". 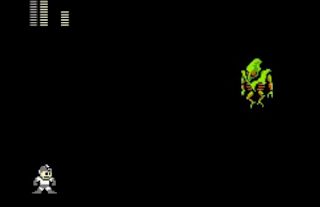 Similar to Double Tribe, the game features "Merging Out". When a "Brother Force" appears in the custom screen, it can be used either to select from that brother's favorites (so much for being told that the Favorites system was gone) or "Merge Out", combining your own Noise with the brother's equipped Noise Change. The example given is Virgo x Ox, where Rockman gains all the attributes from both Noise Changes and becomes a white colored Ox Noise. Don't have any brothers? Here's something else you can do. When you defeat someone on WiFi, you will be awarded with a "Rival Noise" card, which can be inserted into your Brother Band and it will appear in your Custom Screen during battle as if it were a Brother Force. It will contain the data of the Favorites equipped by your opponent during that battle as well as the Noise Change he/she was using. The game will include Voice Chat, though it is unknown to what extent the voice chat will function. The Boss Contest winner is called "Moon Disaster" and has a crescent moon motif. It is described as a conspicuous character fond of song. First editions of the game will come with toys and stationary depending on the store it's bought from. First Edition Kanzen Guides will include the Gemini Spark Noise card for Noise Modification Gear. -Comedic duo "The Bearded Barons" will be promoting SSR3 through various Coro Coro media outlets. Capcom showed off a "newish" SSR3 trailer at TGS. I say "newish" because it primarily displays stuff we've seen in previous trailers with a few additions such as Red Joker gameplay and yes, english subtitles. 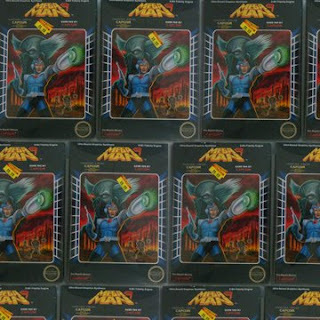 Just four minutes after being stocked, the MegaMan 9 Press Kits sold out. Completely. Gone. "If these kits were a Robot Master, they'd be Flash Man, cause they were gone in a flash (Protodude comment: Actually, more like Quick Man). 3pm PST came, and within 4 minutes, we were sold out of the remaining stock. I'm glad some select Unity members were able to get theirs early, and hopefully a few of the rest of you managed to snag some of these. If you didn't manage to get through, don't forget about the contest! Ahh the every faithful OFLC, the rating board that brought us news of Rockman 9. When have you failed us? 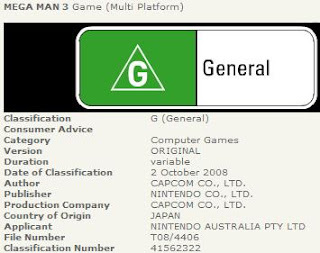 According to the most recent OFLC entry, MegaMan 3 is slated to hit the Wii's Virtual Console sometime in the future. Don't expect to see the game soon though, the rating was recently registered on October 2nd. If MM1 and MM2 were any indication, we may have a bit of a wait ahead of us. Straight from the TGS show room floor courtesy of Dengeki Online, Roll is slated to appear in the upcoming fighter, 'Tatsunoko Vs. Capcom' alongside Rockman Trigger. So, which Roll incarnation exactly? If you guessed Roll Caskett, you're wrong. It's Classic series Roll, equipped with her trusty broom stick! So, now we have Rockman Trigger and Classic series Roll in the roster. Does this indicate the possibility of more seeing Rockman representatives from other series? Zero perhaps? Rockman.EXE? 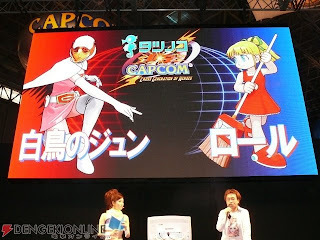 Check out Dengeki Online's TGS coverage for more pics. MegaMan 9 Press Kits On Sale Today! Missed out on the promo code? Ebay auction too much for ya? 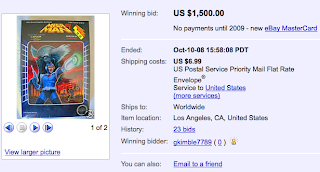 (Bidding ended at $750) Fret not my friends, Capcom is here to help. Beginning today (October 9th) at 3PM PST, Capcom's online store will be selling a VERY limited amount of MM9 Press Kits for $49.95. First come, first served! If you happened to be one of the lucky members who received a promo code, Capcom suggests you redeem it NOW or else you'll miss out. “One never knows. We have a lot on our plates at the moment with SSF2THDR, SF4 and TvC on the fighting front. We’ll see what happens down the line”. TGS begins in a few short hours, we'll just have to wait and see where this goes. Rie Tanaka, the voice actress of Rockman Zero's Ciel and many other anime/game characters, was recently interviewed by "a geek by any other name" at the New York Anime Festival last weekend. While Tanaka doesn't speak of her role as Ciel, she does go over some very interesting topics such as her most difficult role to portray, her fascination with cosplay and much more. Check it out at "a geek by any other name."